Each treatment application has three main steps. Apply the wet lotion throughout the scalp. Comb out as much excess lotion as possible. Use a blow dryer to dry your child’s hair. This dries the lotion on the scalp, and coats any lice in a shrink-wrap-like layer. The dry lotion must remain on the hair and scalp for at least 8 hours. Usually parents leave it in place until the child’s usual bath or shower the next day. The course of treatment consists of 3 applications done at one week intervals. You may order these items from our recommended supplies page. If you order via our links to Amazon, a small portion goes to support this website. But the price you pay remains the same. A large bath towel for draping on your child’s shoulders. 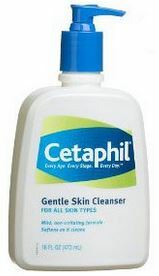 Cetaphil Gentle Skin Cleanser, (8 oz for short hair, 12 oz for shoulder-length or longer hair). 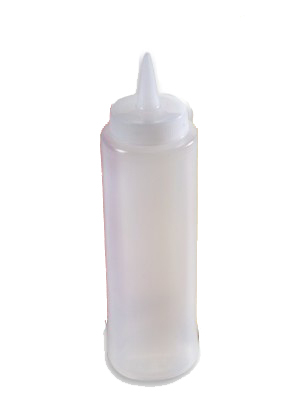 A new 8 oz condiment dispenser such as this one. 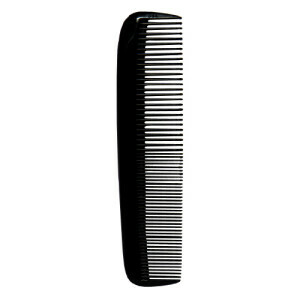 A regular pocket comb such as this one. 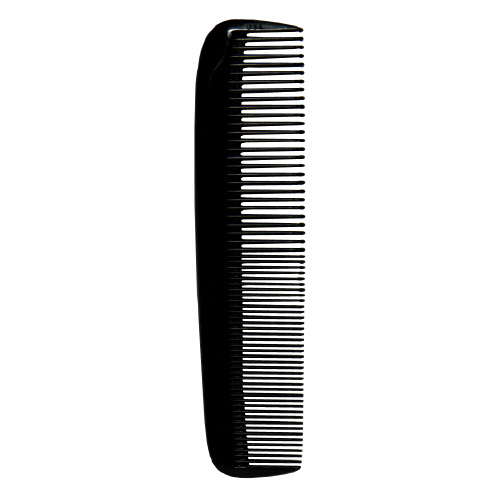 If your child has long hair, you should also get a wide-toothed detangler comb. If you need to remove nits to comply with your school’s “no nit policy,” you will need a Licemeister comb for step 8. In our experience the metal Licemeister comb is far superior to inexpensive, plastic lice combs. Important: Removing nits is NOT necessary for cure. Cover your child’s shoulders with a big dry bath towel to catch the lotion which will drip from the scalp. To boost your cure rate you must cover all the lice with lotion. We advise you to apply so much lotion that it literally overflows the totally soaked scalp and drips off onto the towel. Pour 8 oz of Cetaphil into the condiment dispenser. Step 1. Begin with dry hair. Start at the left of the scalp. Make sure the nozzle is always touching the skin. Apply the lotion zigzag back and forth from front to back and then back to front. Apply to the entire scalp as you move forward until you reach the front of the scalp. Use 1/4 of the bottle. While the lotion is shown in the diagrams below as yellow, actual Cetaphil Cleanser is a translucent pearly liquid which is not visible once dried on scalp. Step 2. Now start at the back of the scalp. Again make sure the nozzle is always touching the skin. Change the direction of your zigzagging application now to “criss cross” the first pattern. Move zigzag front to back then back to front as you move from the right side to the left side of the scalp . Use again 1/4 of a bottle always touching the scalp with the bottle nozzle. Step 3. Use your fingers to thoroughly massage the lotion throughout the scalp and hair. Step 4. Redo steps 1, 2, and 3. Use up another 1/2 bottle of lotion. You now have used a whole bottle of the lotion. Step 5. Does your child have long hair that reaches to the upper back? Then apply another 1/2 bottle of lotion to that large amount of hair from roots to tips and massage in thoroughly with your fingers. Step 6. Wait 2 minutes for lotion to act. Step 8. If you need to remove nits to comply with your school’s “no nit policy,” then use the Licemeister®comb to carefully go through the entire scalp. It will remove many nits. If your child’s school does not have such a policy, then skip this step. It adds 70% more work and is unnecessary to cure children of head lice. Step 9. Blow dry the hair thoroughly, so that the scalp skin, hair roots, and full length of the hair are totally dry. You may use a detangler comb and/or your fingers to make the drying process easier. Anticipate that this will takes 3 times longer than drying hair that is just wet with water. Step 10. You may style the hair now with a sterilized comb and/or brush. Please do not apply any styling gel, mousse, hair spray, or other cosmetic products to the hair while the dried Cetaphil lotion is on the hair. Step 11. 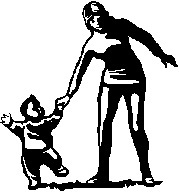 Leave the dried lotion on the child’s head for at least 8 hours, preferably overnight. Step 12. To remove the lotion at the end of the treatment phase, you just shampoo with your usual shampoo, cream rinses, etc. The three clean up steps should be done once a week at the time of the weekly treatment. Sterilize all the family’s combs and brushes. You can choose one of two methods. You may soak the combs and brushes in isopropyl (rubbing) alcohol for 10 minutes or you may put them in the dishwasher on the full hot cleaning cycle. Treat all bedding at the time of each lotion application. Take all sheets, pillow cases, blankets, comforters, and bedspreads from the beds in your house and run them in the dryer for 10 minutes on high temperature. Then put the bedding back on beds. You do not have to wash it. Patients should change to new fresh clothes after each treatment. Put dirty clothes in the laundry hamper for later laundering. a) Parents skimp on amount of Cetaphil Cleanser used. You must use precisely the amount recommended in the detailed instructions or you will fail to coat all the lice with lotion. An uncoated louse will survive the treatment and may go on to reproduce. This is especially important for children with shoulder length or longer hair. You must remember to add an extra half bottle because of the long hair. b) Parents apply the lotion incorrectly to the scalp. Sometimes parents just squirt it on top of the hair and try to massage it in. This is NOT the way we explain in the instructions. You must achieve a uniform coverage of the entire scalp to be effective. It is critical to be touching the scalp with the nozzle the entire time you apply the lotion. The “criss cross” pattern of application assures even, complete coverage. c) Parents do not completely dry the lotion on the scalp. You must dry the scalp so that it is totally dry. The lotion works by drying onto the louse and plugging up its breathing holes. If you leave the scalp and hair partly wet then the lotion can be accidentally rubbed off when your child changes his shirt, lies down on his pillow, rubs his hair, or lies on the carpet or couch. By thoroughly drying the lotion in the scalp, the lotion adheres to the lice and kills them. d) The timing between the applications is wrong. You must use the treatment in three applications done at one-week intervals. The dried lotion kills lice and disrupts their life cycle. If you wait too long for the next application, then baby lice can grow into adults and lay eggs and continue the cycle. If you have questions, please go to our Frequently Asked Questions page. Notice: The Nuvo method for treating and diagnosing head lice has not been evaluated or approved by the U.S. Food and Drug Administration. Cetaphil® is a trademark of Galderma Laboratories, L.P. United States, which has not reviewed or endorsed the material on this web site. Check out our online store for a low-cost, convenient way to order the supplies needed for the Nuvo Method treatment of head lice.